As your Google app must have a unique identifier, the first step is to decide what you want to call it and then register it. If you have created Google applications before, go to Enter the following information:. If this is the first time, you will be prompted to verify your account. 3. Enter your mobile number and click Send. 4. When you receive the authentication code, enter it and click Send. Google invites you to complete the application. • Application Identifier — Enter a unique app ID for your Google app. • Application Title — Enter a name for the app which will be displayed to app users. • Authentication Options — Select Restricted to the following Google Apps domain and enter your domain name. 6. Click I accept these terms, and then click Create Application. Google registers your app. In order to restrict access to your Google application to members of a particular Google Apps domain, you must add the application ID to your Google Apps account using the Google Apps control panel. 2. Enter your application’s unique ID, and click Add it now. 3. 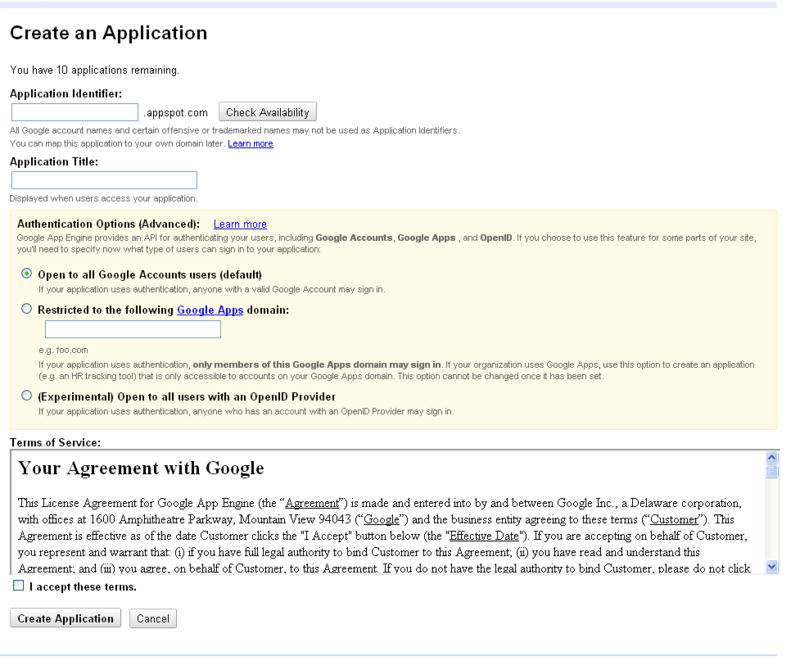 When prompted, read and accept the Google App Engine terms and conditions, and click Activate this service. How you create your Google app and configure its settings file depends on your environment. Microsoft Windows and Apple Mac users can use the graphical user interface provided with their Google App Engine SDK, or use the command line interface. Linux and other platform users can only use the command line interface (CLI). To cover all users, the following explain how to write your application, and configure settings using the CLI. Note: Programming language Python version 2.7 is required. You must create a directory to store your Google application, and its settings file.  In your google_appengine directory, create a <your_app_id> directory. Note: You do not need to use the application’s ID as the directory name, or create it in the google_appengine directory, but doing so makes it easier to identify and maintain applications. The next step is to create the your Google application’s configuration file. Settings for your Google application are stored in the configuration file app.yaml, located in the <your_app_id> directory. The file specifies runtime configuration, such as, how URL paths are associated with request handles, and static files. It also specifies information about the application code, such as, application ID, and version number. You can either download an example file from http://smoothwall.com/en-gb/get-support/product-manuals/federated-login-guide, or create your own using a text editor. For an example of the app.yaml configuration file, see app.yaml. Tip: Indentations are vital in Python scripts. Confirm that the indentations are exactly as they are in the example above. You must create the authentication script that handles the federated login for the Google App Engine application. The script must be named main.py, and be located in the <your_app_id> directory. You can either download an example file from http://smoothwall.com/en-gb/get-support/product-manuals/federated-login-guide, or create your own using a text editor. For an example of a main.py file, see main.py.